"I'll be back. Sometime next year." Recently it has occurred to me that the major events of our time—from the O.J. Simpson trial to President Clinton's impeachment to 9/11 to the Iraq War—have almost had no time to seep into history before Hollywood began figuring out how to dramatize them. Yes, I know that many World War II movies were made during the war, but they were meant as propaganda, not pure drama. The trend in show business today seems to be to take historical events and package them for no other purpose than to entertain. That's not a criticism, but merely an observation. Over There is the most recent item in this trend, being produced by TV heavyweight Steven Bochco for FX. 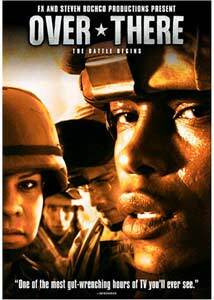 Presented here on DVD, the pilot episode introduces us to a squad of Army soldiers who are shipping off to Iraq. Pfc. Bo Rider (Josh Henderson) is your standard all-American male, filled with guts and guided by a cool head. He can quickly be singled out as the inevitable leader of the men and women who will be landing in Iraq shortly. The other members of the squad are introduced to the audience at lightning fast speed, but the others that stand out in this first episode are Pvt. Frank "Dim" Dumphy (Luke MacFarlane) and Pfc. Esmerelda "Doublewide" Del Rio (Lizette Carrion). Dim is an Ivy League educated man, experiencing severe familial problems, who somehow wound up as a private in the military, thus earning him his nickname. Doublewide provides one of the show's most touching moments when she speaks to her baby boy prior to shipping off. The rest of the cast receives relatively small screen time in this first episode, though each of them gets a scene to introduce his or her character. True to Hollywood conventions, the squad lands into the middle of a firefight. Director Chris Gerolmo plants the audience right into the middle of it, creating a frenzied atmosphere of battle. We soon figure out that Bo and his squad are replacements, entering into the war well after its initial stages. Led by the experienced Sgt. "Scream" (Erik Palladino), the crew confronts a group of enemy fighters who are hiding in a mosque. Chaos and miscommunication ensue and Scream laments the PR aspects of the war that prevent him from doing his job. Things get fairly hairy, particularly when the Iraqi insurgents come into close contact with the squad, and the horrors of war are shown in graphic detail. I have to admit, I find it a bit far fetched that these soldiers would undergo as much combat experience within their first week as is depicted in this episode (anybody who has seen Gunner Palace is likely to second this motion). However, as an introduction to the series, the work here is quite impressive. It's difficult to judge a show on the basis of one episode, but if subsequent storylines are told with the technical proficiency of this one, then FX may have one of the best shows on TV. Politics are not a factor here, for either the viewer or the talent involved, because Bochco and company aptly realize that, in the heat of battle, nobody really gives a damn whether Bush or Kerry is president. My fear is that Over There might wind up like just your basic action TV program. There is hope provided in the pilot that the writers will focus on the drama at home and will provide moments where the soldiers are simply sitting at their headquarters. However, the heavy emphasis on combat shown here may be indicative of a 24 kind of program. That may be all well and good as far as entertainment is concerned, but if the intention is to pay homage to our troops, then let's all hope the powers-that-be will craft a measured drama with the purpose of shedding some light on the conflict in Iraq. There's great promise in this drama, let's hope it lives up to it. NOTE: The violence presented here is quite graphic and ought not to be viewed by children, even if it is airing on basic cable television. Some of the images are every bit as horrifying as footage from Saving Private Ryan. Image Transfer Review: Presented in 1.78:1 anamorphic widescreen, the DVD looks fantastic. The picture is clear, colors are vivid, and detail is strong. Excellent work. Audio Transfer Review: The Dolby Stereo 2.0 mix, when played in Pro Logic, makes a very engaging listen. Sound separation and directionality are frequent, though a genuine 5.1 track would be much more dynamic. Nonetheless, this is a solid piece of work. Extras Review: Prior to the main menu starting up there is an extended promotional TV spot for Over There. It's shown in 1.78:1 widescreen, as is the FX Promotional Trailer that gives a quick look at all the various original programs aired on the channel. There's also a documentary, Over There: An Inside Look (16m:16s). Featuring interviews with creator Steven Bochco, writer-director Chris Gerolmo, and some cast members, this is your basic publicity piece. However, the comments are genuinely interesting as each person explains his approach to the material and why the elected to do the show. Nothing especially profound is discussed here, but it sounds like all involved are earnest in their desire to make a show that truly reflects the situation in Iraq for our soldiers. The quality of Over There cannot yet be determined, but this pilot episode shows that FX is the home of well-produced dramas. Whether the series will be a realistic depiction of war or an action program remains to be seen. At any rate, this DVD is a well done promo piece for the show, with a solid sound mix and stellar image. Extras are scarce, but welcomed.